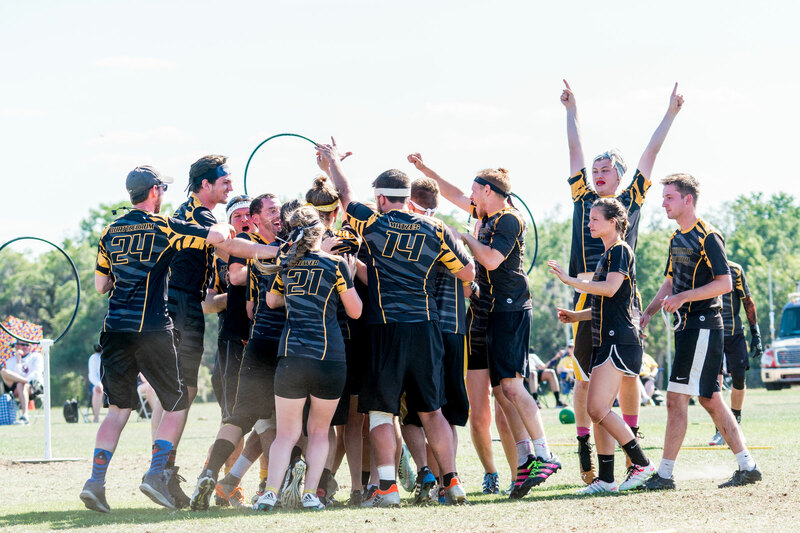 The second half of the Elite 8 round featured a matchup between Mizzou Quidditch and Rochester United. Both teams seemed well-matched, favoring similar styles of offense and defense. Mizzou and Rochester relied heavily on their beaters to clear lanes and create chaos for their ball carriers to skirt around. Both Mizzou’s and Rochester’s beaters were aggressive right out of the gate, maintaining their intensity late into the game. That being said, practically every beater in the game was guilty of making wild beats from midfield and attempting trick shots to knock balls out of other players’ hands. Otherwise, defense from both teams was scrappy at best, resulting in several collisions, scuffles over loose balls, and a rotating door on both penalty boxes. Quaffle play vacillated between slow walk-ups and wild fast breaks. Mizzou keeper Jacob Parker scored Mizzou’s first goal shortly after brooms up, with Rochester United responding with a goal less than a minute later. Such was the pattern for the majority of the game. Almost like clockwork, both teams would meander up the field until one side finally scored, sending the other into a frenzy to match goals. The game was tied 60-60 when seekers entered play. Shortly after, though, Parker received his second yellow card for illegal contact and was subsequently removed from the game. Parker’s exit stalled Mizzou’s momentum, allowing Rochester to put 20 more points up on the board. But, at just under 19 minutes, Dom Stelzer deftly caught the snitch to edge out a 90*-80 victory for Mizzou.